A Warm Message to Parents who are Concerned about Toy Safety. As parents ourselves, K's Kids shares the same concern on toy safety as all other parents and grandparents do. Our toys are selling in over 60 countries worldwide and we have taken very straight measures to make sure that every single piece of our toys goes through tests that meet all safety regulations in all of our selling countries. Our testing procedures start from design concept evaluation test, materials test, pre-production test, on-line production test, finished product test, mechanical test, chemical test, flammability test, metal detecting test to even packing test and abuse test. All tests are done with the ultimate aim - to provide high quality and safe toy to our loved ones. 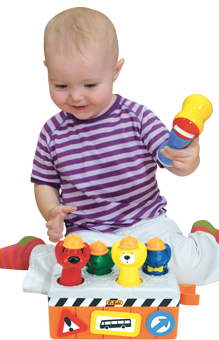 K's Kids can claim ourselves as one of the baby toy brands with low recall rate. Over the last 15 years, we had only one design recall due to the change of sound level standard made in Europe. K's Kids toys are well known to be safe and fun for babies and toddlers, that is the reason why we have won 100 world renowned awards just in a short period of 15 years. Once again, we want to guarantee all K's Kids customers that we will continue to produce toys with the high safety standard for your babies to enjoy.